Baba Hardev Singh Ji was born on February 23, 1954 in Delhi in the family of Baba Gurbachan Singh Ji and Rajmata Kulwant Kaur Ji. As a child, Hardev was fortunate to have worldly as well as spiritual blessings of his parents, and the then Satguru Baba Avtar Singh Ji and Jagatmata Budhwanti Ji as his grand parents. Baba Hardev Singh Ji received his elementary education at home. With his sharp intellect, he learnt alphabets of Hindi, English and the counting very quickly. Thereafter, he was sent to Rosary Public School, Sant Nirankari Colony, Delhi, where by sweet nature and intelligence he cast spell on teachers and fellow students. On completion of his school education at Patiala, Baba Hardev Singh Ji returned to Delhi and started further education under Delhi University and also took keen interest in the socio-spiritual activities of the Mission. He became very regular in congregations and Sewa. His humility earned him the name ‘Bhola Ji’. In 1971, Baba Hardev Singh Ji joined the Sant Nirankari Sewa Dal and enjoyed himself serving in cotton Khaki (brown) uniform. He organized “Youth Forum” in 1975, which focused on promoting truthful and simple living, service with devotion and love, refraining from incurring undue expenses and practicing prohibition. During the Annual Nirankari Sant Samagam in Delhi in 1975, Baba Hardev Singh Ji was married in a simple ceremony to Sawinder Ji, daughter of devoted saints Shri Gurumukh Singh Ji and Smt. Madan Ji of Farrukhabad, Uttar Pradesh. Born on January 12, 1958, Sawinder Ji now addressed out of love and devotion by devotees of the Mission as Pujya Mata Ji, is well educated and duty conscious. Baba Hardev Singh Ji became the Spiritual Head of the Mission under adverse circumstances when its Spiritual Master and a crusader for unity, peace and tranquility Baba Gurbachan Singh Ji had fallen to the bullets of some conservative elements on April 24, 1980. Young Hardev had lost not only the Satguru but his beloved father also. This was the moment when forbearance, patience and tolerance of every follower of the Mission were under severe stress and a grave test. The very future of the Mission stood challenged. Baba Hardev Singh Ji ruled out even the remotest thought of vengeance saying that ‘it would go contrary to what Baba Gurbachan Singh Ji lived and sacrificed his life for’. He exhorted devotees to carry on his message of compassion, goodwill, love and truth and pray for the welfare of one and all. The result was quite instantaneous and healthy. The followers remained non-violent even in the face of serious provocations from fanatics and extremists. And when the day came in 1981, Baba Ji ordained it to be observed as Manav Ekta Divas (Human Unity Day). The Mission found tremendous expansion in all directions. Today Delhi and Greater Delhi have 30 Sectors, while the country is divided into 68 Zones. There are more than 3000 branches of the Mission in India and about 200 abroad. Baba Hardev Singh Ji Maharaj was quite meticulous in his approach to the organizational requirements of the fast expanding Mission. He convened a conference in Delhi in March, 1987, on the lines of the two Mussoorie Conferences convened by Baba Gurbachan Singh Ji in 1965 and in 1973. It was decided, among other things, to organize blood donation camps at different places on the occasion of Manav Ekta Divas as a gesture of selfless service to humanity and a humble acknowledgement of the supreme sacrifice of Baba Gurbachan Singh Ji and other martyrs for the noble cause of human welfare. Another important decision of this Conference was to set up a full-fledged Department of Social Welfare. Similar special General Body meetings followed in 1995, 2002 and 2009. The guidelines for Pracharks and the decisions for the saints associated on the organizational side were published and shared with every follower of the Mission. Baba Ji left no room for any doubt or difference of opinion. The Nirankari Sarovar Complex with its 5-acre reservoir of neat and clean water and another 20 acres of lush green lawns with rows of beautiful flower plants, the Complex is already a valuable anti-pollution gift to Delhi ecology by Baba Hardev Singh Ji. In the same complex we have today a prestigious institution of the Mission, the Nirankari Museum – Journey Divine. Established in 2005, it is a fine presentation of the Mission’s ideology in the latest audio-visual and still camera technology. 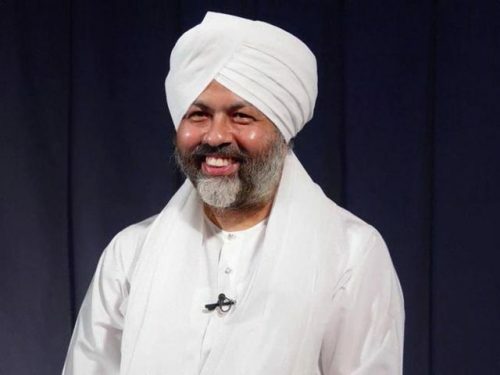 The Fountain of Oneness, an enchanting unison of sound, light and water representing the melody of sacred words, the divine light of God-knowledge and the sweet nectar of love is another landmark of the Mission dedicated to mankind Baba Hardev Singh Ji on February 23, 2013, his 59th Birthday. With several other structures with public facilities and amenities including a 3-storey administrative block, a library and a cafeteria, providing the most befitting backdrop in such a picturesque surrounding, Nirankari Sarovar Complex is thus a fine example of harmony between architectural skill and spirituality gifted to mankind by Baba Hardev Singh Ji. The Mission has its own studio. And since January 1997 the Mission is on Internet, with 37 branches across the world today. In order to provide the requisite momentum to the Mission’s magazines, a new department was created for the same. The circulation of ‘Sant Nirankari’, ‘Ek Nazar’ and ‘Hansti Duniya’ recorded tremendous increase. The Publications Department also received special attention. Baba Hardev Singh Ji Maharaj paid special attention to the youth abroad. He encouraged them to participate in various activities of the Mission without coming into conflict with their local environment. No wonder, the First Nirankari International Samagam held in Birmingham (UK) on August 11 and 12, 2012 was primarily planned, organized and supervised by the youth. The Sant Nirankari Mission is a spiritual movement which has already spread across the globe. It seeks to improve the quality of life of its followers through spiritual enlightenment. It endeavors to strengthen the spirit of Universal Brotherhood through the realization of oneness of the Supreme Father, God. No doubt the Truth we preach is eternal, the Mission began as a spiritual movement in Peshawar on May 25 in 1929. Its founder, Baba Buta Singh Ji, received Brahm Gyan from Bhai Sahib Kahan Singh Ji, but the latter is not considered a part of the movement, simply because he did not start it. The immediate objective of the Mission was to promote the concept of the realization of God amongst those who were living in the darkness of ignorance, following various dogmas and rituals and suffering from all kinds of false beliefs and superstitions. In 1943, Baba Buta Singh Ji breathed his last. He, however, named Baba Avtar Singh Ji as his successor as the Head of the Mission and formless Satguru manifested himself in the latter. Similarly, on 3rd December, 1962, Baba Avtar Singh Ji reverted back as an ordinary missionary while Satguru appeared in Baba Gubachan Singh Ji as named by the former, of course. Ever since the supreme sacrifice of Baba Gurbachan Singh Ji on April 24, 1980, His Holiness Baba Hardev Singh Ji Maharaj has been carrying out this divine responsibility.